The following is the official blurb from the organisers of the Knitting and stitching show 2015 – it boils down to a fun day out for all crafters or if you just like to look at pretty things. Have a great time if you decide to go – I hope to be there on the Friday, please say hello if you see me! 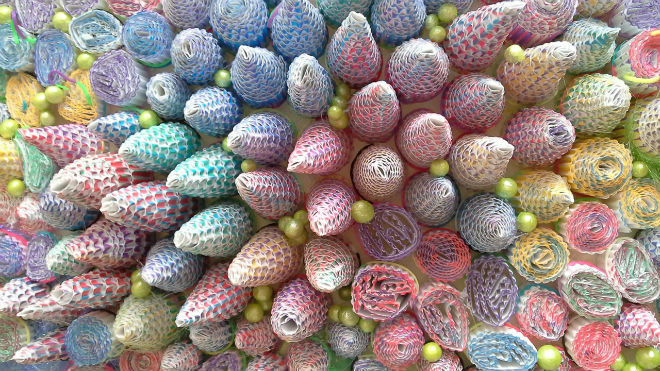 “The Knitting & Stitching Show presents some of the finest textiles in Ireland covering all aspects of craft and making, from crochet to patchwork & quilting, embroidery to dressmaking plus knitting, beadwork, home furnishing and more. The show uniquely combines learning, shopping and inspiration to present one of the most comprehensive craft shows in Europe. 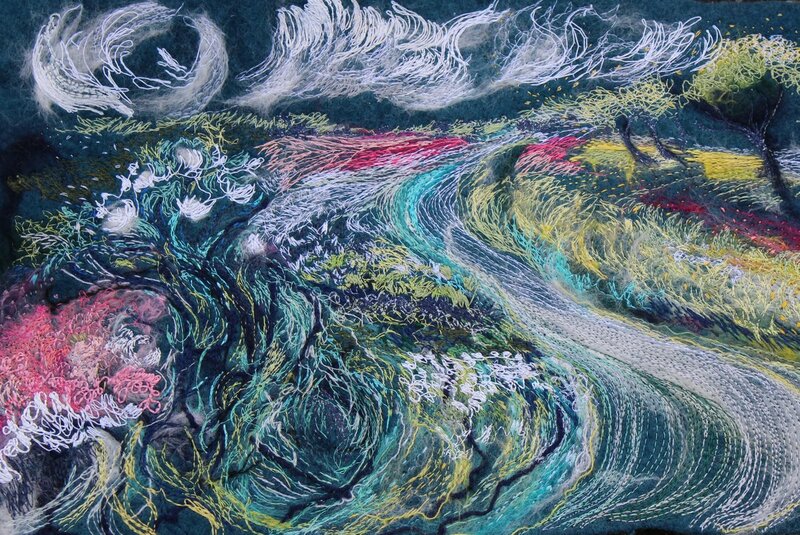 There are eighteen professionally curated Galleries offering inspirational displays of fibre art, embroidery, patchwork & quilting, dressmaking and knitwear. 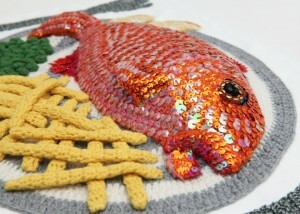 One Gallery not to be missed is the ‘Stitchmongers’ by Kate Jenkins, who presents a traditional fishmongers made entirely of knitted, crocheted and sequined fish. Sardines, caviar, cod, bream – it’s the place to visit! If you’d like to stock up on craft supplies, The Knitting & Stitching Show provides the best shopping experience in Ireland with over 200 companies under one roof. 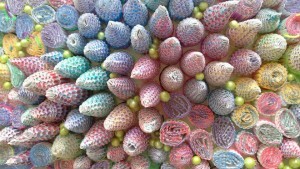 Shop for yarn, fabric, haberdashery, threads, kits, patterns, books and needles. If you’re after a new sewing machine, all the major brands will be represented giving you the opportunity to test drive the latest models. 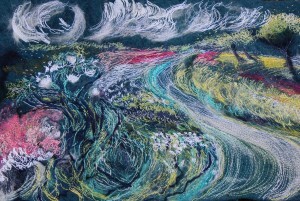 The Learning Curve programme offers an enormous choice of workshops including needle felting, crochet, free-motion machine stitching, applique, shibori dyeing and embroidery. We offer a series of dressmaking classes giving you the chance to try zip insertion and pattern alterations among other techniques. There are also more traditional subjects such as Mountmellick embroidery and Carrickmacross lace. A one hour workshop costs €12.00 and includes all the materials required. The Knitting and Stitching Shows are a must-visit for crafters and textile lovers; join our community and enjoy a fabulous day out. You’ll go home loaded with ideas and supplies for your next project! 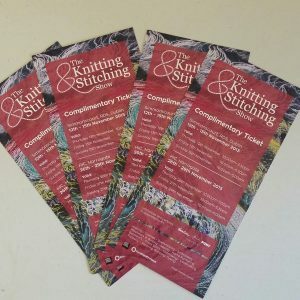 For a €2 discount* visit www.theknittingandstitchingshow.com/dublin or call +44 (0) 1473 321872 and quote EX15 by Wednesday 11th November at Midday.